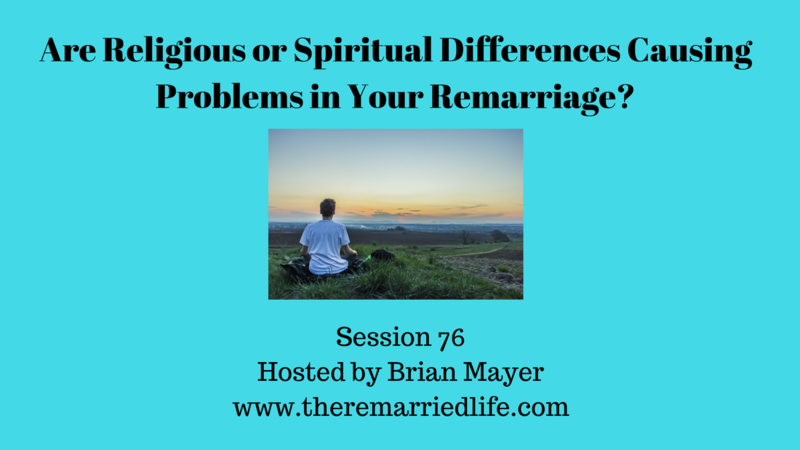 Today’s episode is all about how spiritual or religious differences may cause a divide in your relationship and in your family. Let’s first talk about the difference between spirituality and religion. These are different and each can cause it’s own issues. Spirituality: being concerned with the human spirit or soul instead of material or physical things. Religion: the belief in a superhuman controlling power, especially a personal God. So that is the dictionary definition, but I like to define these words in different terms. For me spirituality is all about a relationship with God. It is a heart connection and everything else grows from that. Religion to me is more about the daily practice of working to get toward God whether or not your heart is right or not. For example someone can go to church, read the Bible, be a “good” person and not necessarily have a close relationship with God. Are my partner on the same page spiritually? Are my partner on the same page with regard to religious practices? You will differ in how to have a relationship with God. According to Christianity, God defines the only way to have a relationship with God is to surrender to the lordship of Jesus Christ. Other spiritual connections do not believe this and in fact some argue that you don’t serve the same God. When times get tough, you will both be turning toward something different. One will choose a personal relationship with a living and resurrected savior, and as far as all other spiritual connections it is my understand that there is no being that has died in our place and was resurrected. Where to go to church if at all? What type of people to associate with? Those who are fellow believers and who are not? What resource to use to gather strength for life. Believers in Christianity will use the Bible and others will use something else. What should the children believe? Some couples will say that they can believe whatever they choose. This means that they will be receiving the spiritual and religious foundation from outside sources. So you may find that they choose neither and choose something else. How would this feel to both of you if this happened? What holidays should be celebrated? Maybe you have decided early on in your relationship to do more than one. This works now but will it always work? When an outside third party is sought to help with your marriage would you seek a Christian pastor? If so how would that fit in your relationship? What will you use to define your moral compass which is what is to be used as the instrument by which a person’s ability to judge what is right and wrong and act accordingly. If you are dating and not yet married, you may want to seriously consider everything we talked about today and weigh that against pursuit of marriage. I am not here to tell you what to do, but I will say that the Bible does say this about these differences, “Do not be unequally yoked with unbelievers. For what partnership has righteousness with lawlessness? Or what fellowship has light with darkness?” 2 Corinthians 6:14. You might now be asking yourself, what if I am married to an unbeliever or someone of a different faith. According to the Bible, it states that you should not leave an unbeliever and that the only time this is acceptable is when the unbeliever voluntarily wants to go. See 1 Corinthians 7:13,15. Understand each other’s childhood and where these beliefs may be rooted and the importance of them. Ask questions about each other’s adolescence and whether or not belief systems began to change. Talk about previous marriages. Was there an equal yoke? If so what did you practice together and how did that work? If there was an unequal yoke, talk about those differences. Discuss present feelings and practices toward your spirituality and religious practices. Brainstorm asking each other what if questions about how certain practices would be resolved with each of you. This is an important subject that you owe each to talk through patiently and work on a way to resolve or respectfully accept differences.